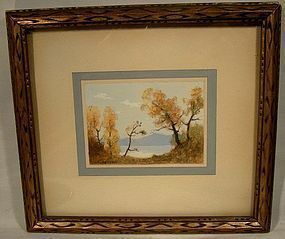 A John Hubert Beynon watercolor painting believed to be painted in the 1930s. This vintage lovely small - 3-1/2" x 2-5/8" - size watercolour is in a chip carved gilt wood frame. This Canadian artist was born in Minnedosa Manitoba Canada in 1890. He painted landscapes in Ontario and Quebec. He is represented in the National Gallery of Canada collection. He studied art in New York and in the Central Ontario School of Art. This painting shows a hilly lake shore with windswept trees. The frame measures 7-1/4" x 6-1/2" . It is signed J.H. BEYNON in the lower left, his name is also written on the back, along with L. BUCKBY in ink and 247 338 guild along with a tag from the framing shop. This painting is in excellent vintage condition with no foxing, tears, fading, losses or damage. Please note it is not sealed with paper on the back All items are thoroughly and conservatively graded and all condition issues are noted; all items are vintage or antique and may have slight signs of gentle use as would be expected. Silver and silver plated items are hand-polished, not buffed, and our halogens and magnified images may exaggerate otherwise barely noticeable scratches and flaws. GUARANTEE: ALL of our items are antique or vintage and from the period listed. NONE are reproductions or recreations. Expedited insured tracked parcel shipping to the U.S. starts at $22 and expedited shipping within Canada starts at $12. Rates vary by destination, value, size, weight, payment option and shipping method. Other payment, tracking and insurance options are available - please inquire. We ship worldwide - please contact us for an accurate shipping quote with your postal code or country. **** PLEASE NOTE: We DO NOT ACCEPT PAYPAL**** © Fiona Kenny and www.fionakennyantiques.com -unauthorized use and/or duplication of any part of this material without express and written permission from this site’s author and/or shop owner is strictly prohibited. A beautifully painted pair of framed watercolour photo renderings c1880-1900. They consist of a young man and woman in mid-Victorian dress; each image is done on Victorian photographic print paper and they measure 6-3/4" x 4-3/4". It was common to overpaint old and fading photographs, however these are of such fine quality and detail that they were most likely done from a mirrored projection, another common method of photographic rendering (we can't find any photographic detail under the painting with visual magnification). Each has the legend J. POWELL PHOTO on the image (even the J Powell is over-painted). The frames are an attractive matched pair of gilt painted wood, but are fairly recent in manufacture - the pictures were framed and matted less than 20 years ago. The couple is quite handsome, and they can be your new instant ancestors.... 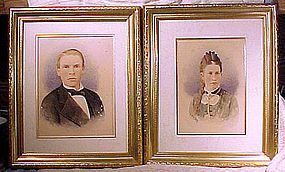 This pair of watercolour portraits is in very good original condition with no losses, damage or repairs other than a faint water stain and a couple of fox marks on the lady and some spots of missing colour on the gentleman (possibly from removal from some old glass to which the photo/picture had adhered). Each has been recently reframed and matted, and the spots on the man could be restored. All items are thoroughly and conservatively graded and all condition issues are noted; all items are vintage or antique and may have slight signs of gentle use. Expedited tracked and insured parcel shipping to the U.S. starts at $27 (other spots may vary, air is higher). Items paid with a credit card will be shipped to confirmed addresses only. We do ship internationally. All of our prices are in $US. PLEASE NOTE: We DO NOT accept PayPal, only VISA and MASTERCARD.